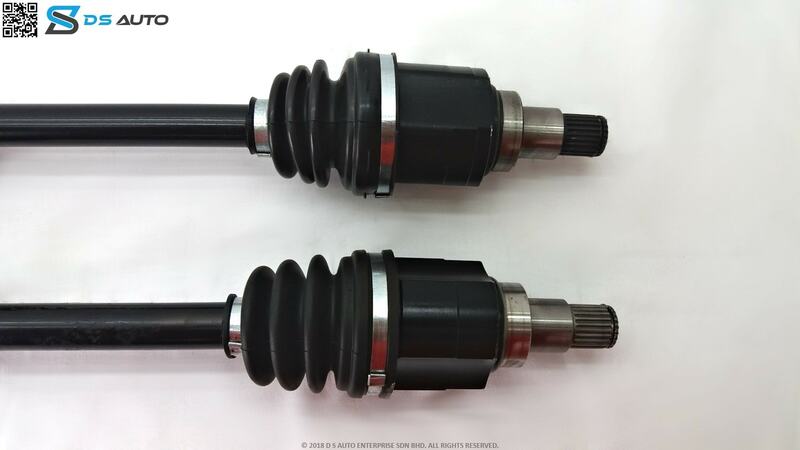 This is Perodua Alza drive shaft set, showcasing both the drive shafts from the side view. This is Perodua Alza drive shaft set, showcasing the outer constant velocity joint. 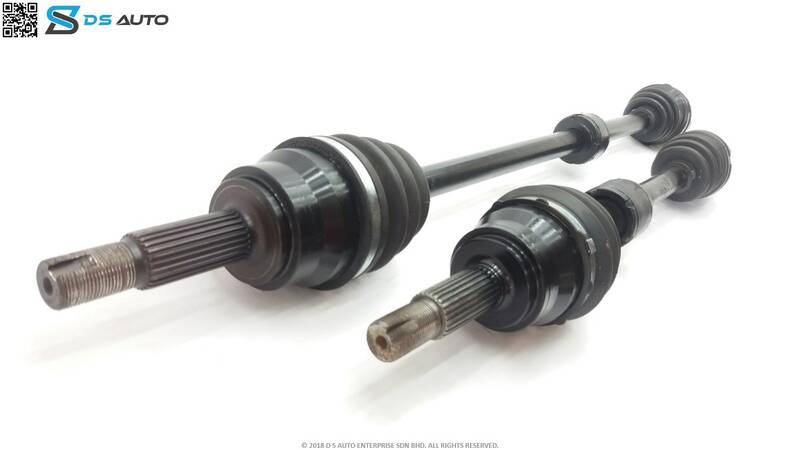 This is Perodua Alza drive shaft set, showcasing the inner constant velocity joint. Is your Perodua Alza giving you problems? Looking to get your drive shaft replaced? 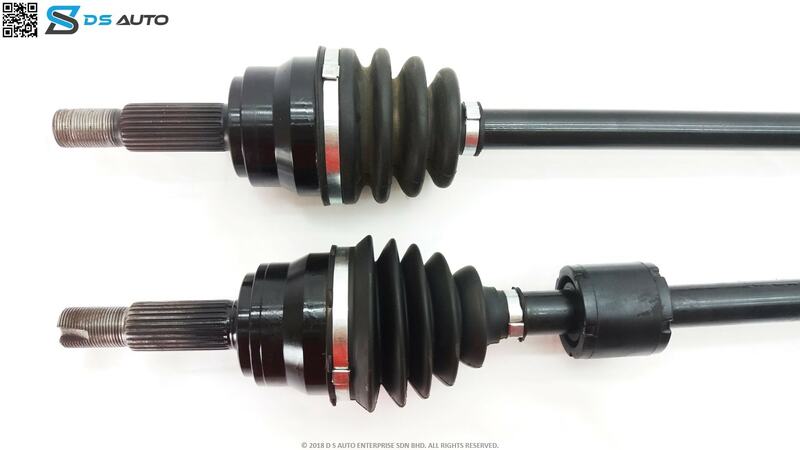 Speak to D S Auto‘s customer service now to get your Perodua Alza drive shaft. The Perodua Alza is a Multi Purpose Vehicle produced by Malaysian automobile maker, Perodua. This B-segment vehicle based on the Daihatsu Boon Luminas is Perodua’s first MPV and is launched in 2009 and is still ongoing as of today (2018). Perodua first launched the Alza in two variants, 1.5 Standard and Premium with either 4-speed automatic or 5-speed manual transmissions. The Alza comes with a 1.5-litre 3SZ-VE DVVT engine. The standard variant came with projector headlamps, LED taillights, centre-mounted meter panels and a second row seat with a 150mm sliding room on rails. The audio system supported CD, MP3 and WMA formats. On the other hand, the Premium version had volume control, radio channel dial, USB port and Bluetooth connectivity in addition to these other features. After the initial launch, Perodua began taking orders for the Advance version slated to be released in March 2010. This advanced version was more luxurious with complete body kit, GPS with reverse camera, tinted windows, a 5-inch touch screen and leather seats. Then, An M2 Edition based on the Advance model was launched in 2011 with the same price as the advanced. In early 2014, Parodua gave the Alza a facelift. The facelifts came in three variants: the Standard and Advanced version and a new Special Edition version. The variants are the Standard (MT & AT), SE (Special Edition, MT & AT) and Advanced Version (AT only). The face lifts came with a more sculptured front bumper, a thicker grille and a reshaped lower air intake. The SE version came with a five-piece body kit giving it a sportier look. Following that, the Standard variant was replaced by the Alza S in 2015. Even with added features, the price remained the same with the Standard variant. Soon after, the Alza was given a second face lift in 2018. The three variants from the previous face lift were retained. However, only the SE and Advanced variants had minor external remodelling with a new 15-inch titanium alloy wheels, new twin-bar grille, new front bumper with a larger lower intake, and inclusion of parking sensors. For safety there is dual front airbags and ABS with EBD. The Standard and SE variants have a new audio system with USB and Bluetooth functionality. The Advance now comes with an Android-based touch-screen multimedia system with Smart Link and Bluetooth. How much does the Perodua Alza cost? The Perodua Alza went on sale with prices ranging from RM56,000 to RM65,000 per unit for the standard model and between RM66,000 and RM70,000 for the advanced version. The prices of the latest facelift are still within these ranges. The Alza got about 3,500 bookings ten days before its launch. Alza was the best-selling MPV in Malaysia for 2010 selling a total of about 42,000 units. 1.5 litre 3SZ-VE DVVT engine paired with either a five-speed manual transmission or a four-speed automatic transmission. Solar and security window film. Android-based touch-screen multimedia system with Smart Link. Who are its direct competitors? The Perodua Alza looks similar to Proton Exora but the Alza is cheaper than the Exora. Toyota Avanza is another competitor for the Alza. The Alza generally has good reviews among users because of its affordability and big space.